My boyfriend and I have a habit of opening bottles of wine we can’t finish. Last night we opened a bottle of rosé that I really didn’t want to see go to waste. 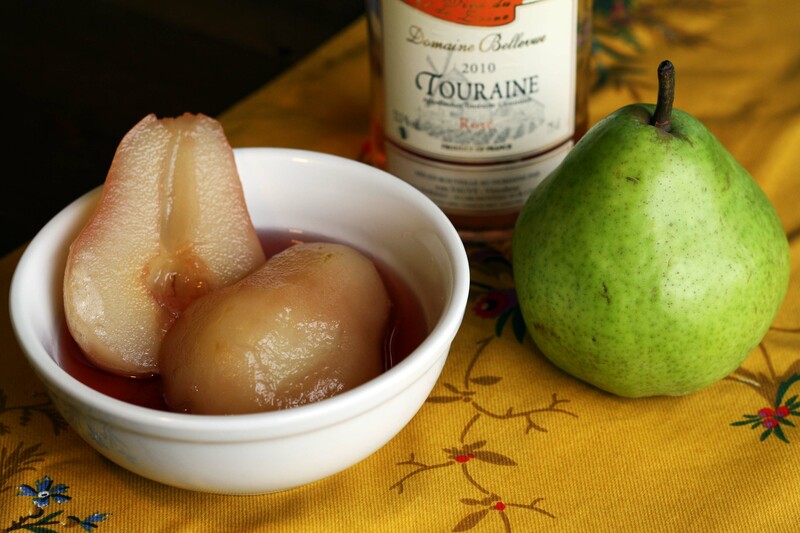 How better to put the remainder to use than by making rosé poached pears? This is one of those desserts that’s deceptively easy. The recipe below is adapted from this one; I’ve adapted it to serve 1 to 2 and made it a bit more economical. In a small saucepan, whisk together the sugar, water, wine and vanilla, and bring to a boil. While the liquid is coming to a boil, prepare an ice bath by filling a large bowl half-way with cold water and several ice cubes. When the liquid has come to a boil, add the pear halves to the saucepan, cut side up, and reduce the heat to a simmer. Cut out a round piece of parchment paper and place it over the surface of the poaching liquid. Simmer until the pears become translucent and tender (a knife should slide easily into them), about 20 minutes. The cooking time will vary depending on the ripeness of your pears, so you’ll want to keep an eye on them. Once the pear halves are done, use a slotted spoon to gently transfer them into a metal bowl, and then place the metal bowl in the ice bath. Pour the remaining liquid into the metal bowl with the pears. Serve the pears cold or at room temperature, with a little bit of the poaching liquid. Serves 1 (or 2 if you’re willing to share). This entry was posted in recipes and tagged cooking for 1, easy desserts, rosé poached pears, what to do with leftover rosé. Bookmark the permalink.